This fur wrapped medicine shield is 20" in diameter and overall the shield is approximately 40" long. The pictures don't do this one justice! This Coyote medicine shield has a dreamcatcher with many natural turquoise stones in the web, and a large quartz crystal in the web below the coyote pelt. The hoop on this medicine shield is wrapped in fur. 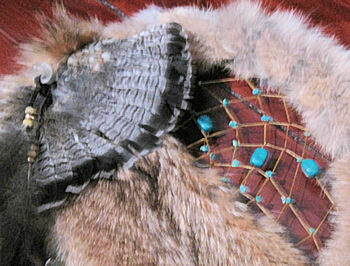 Nearly a full coyote pelt is draped diagonally over a dreamcatcher that has several large turquoise nuggets and many smaller turquoise stones. 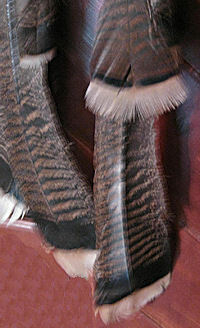 At the top of the coyote pelt is a full tail fan from a ruffled grouse held in place with a deer antler button. Deer symbolizes gentleness. 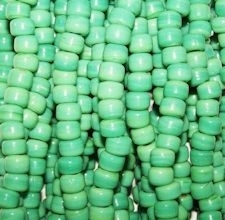 The ten long buckskin fringes are decorated with dozens of irridescent tipped brown turkey feathers attached with glass crow beads and brass beads. There is a large, hard to find bronze turkey tail feather at the end of each fringe attached with another brass cone. This artifact replica is handmade in the USA. Because each one is handmade especially for you, the one shown is representative, and the one you receive may vary slightly. 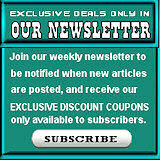 Allow up to a week for construction time for this item. This product was added to our catalog on 10/22/2010.